JULY 4, 325, WAS A MEMORABLE DAY. About 300 Christian bishops and deacons from the eastern half of the Roman Empire had come to Nicea, a little town near the Bosporus Straits flowing between the Black Sea and the Mediterranean. The bishops and deacons were deeply impressed. After three centuries of periodic persecutions instigated by some Roman emperor, were they actually gathered before one not as enemies but as allies? Some of them carried scars of the imperial lash. One pastor from Egypt was missing an eye; another was crippled in both hands as a result of red-hot irons. But Constantine had dropped the sword of persecution in order to take up the cross. Just before a decisive battle in 312, he had converted to Christianity. Nicea symbolized a new day for Christianity. The persecuted followers of the Savior dressed in linen had become the respected advisers of emperors robed in purple. The once-despised religion was on its way to becoming the state religion, the spiritual cement of a single society in which public and private life were united under the control of Christian doctrine. If Christianity were to serve as the cement of the Empire, however, it had to hold one faith. So the emperors called for church councils like Nicea, paid the way for bishops to attend, and pressed church leaders for doctrinal unity. The age of Christian emperors was an age of creeds; and creeds were the instruments of conformity. We can see this imperial pressure at work at Nicea, the first general council of the church. The problem that Constantine expected the bishops to solve was the dispute over Arianism. Arius, pastor of the influential Baucalis Church in Alexandria, Egypt, taught that Christ was more than human but something less than God. He said that God originally lived alone and had no Son. Then he created the Son, who in turn created everything else. The idea persists in some cults today. Arius made faith in Christ understandable, especially when he put his teaching in witty rhymes set to catchy tunes. Even the dockhands on the wharves at Alexandria could hum the ditties while unloading fish. Arius’s teaching held a special appeal for many recent converts to Christianity. It was like the pagan religions of their childhood: the one supreme God, who dwells alone, makes a number of lesser gods who do God’s work, passing back and forth from heaven to earth. These former pagans found it hard to understand the Christian belief that Christ, the Divine Word, existed from all eternity, and that he is equal to the Almighty Father. So Arianism spread, creating Constantine’s concern. The Council of Nicea was summoned by Emperor Constantine and held in the imperial palace under his auspices. Constantine viewed the Arian teachings—that Jesus was a created being subordinate to God— as an “insignificant” theological matter. But he wanted peace in the Empire he had just united through force. 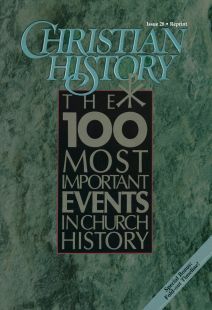 When diplomatic letters failed to solve the dispute, he convened around 220 bishops, who met for two months to hammer out a universally acceptable definition of Jesus Christ. Once the Council of Nicea convened, many of the bishops were ready to compromise. One young deacon from Alexandria, however, was not. Athanasius, with the support of his bishop, Alexander, insisted that Arius’s doctrine left Christianity without a divine Savior. He called for a creed that made clear Jesus Christ’s full deity. In the course of the debate, the most learned bishop present, the church historian Eusebius of Caesarea (a friend and admirer of the emperor and a half-hearted supporter of Arius), put forward his own creed— perhaps as evidence of his questioned orthodoxy. The expression homo ousion, “one substance,” was probably introduced by Bishop Hosius of Cordova (in today’s Spain). Since he had great influence with Constantine, the imperial weight was thrown to that side of the scales. After extended debate, all but two bishops at the council agreed upon a creed that confessed faith “in one Lord Jesus Christ, . . . true God of true God.” Constantine was pleased, thinking the issue was settled. As it turned out, however, Nicea alone settled little. For the next century the Nicene and the Arian views of Christ battled for supremacy. First Constantine and then his successors stepped in again and again to banish this churchman or exile that one. Control of church offices too often depended on control of the emperor’s favor. The lengthy struggle over imperial power and theological language culminated in the mid-fifth century at the Council at Chalcedon in Asia Minor (today’s Turkey). There the church fathers concluded that Jesus was completely and fully God. And finally, the council confessed that this total man and this total God was one completely normal person. In other words, Jesus combined two natures, human and divine, in one person. This classical, orthodox affirmation from Chalcedon made it possible to tell the story of Jesus as good news. Since Jesus was a normal human being, bone of our bone and flesh of our flesh, he could fulfill every demand of God’s moral law, and he could suffer and die a real death. Since he was truly God, his death was capable of satisfying divine justice. God himself had provided the sacrifice. The Council of Nicea, then, laid the cornerstone for the orthodox understanding of Jesus Christ. That foundation has stood ever since. Dr. Bruce L. Shelley is professor of church history at Denver Seminary and a member of the advisory board of Christian History.